Digging trenches might be one of the most difficult tasks to face commercial property owners and homeowners, who often lack the tools necessary to quickly and easily dig the kinds of trenches that can be used to mount fences, bury various kinds of cables or perform other tasks on a typical property. The good news is that companies like Brown have created their own trench-digging products, such as the TrenchMaster, which can make this process largely automated and very easy. With powerful engines and sharp blades on the scene, the Brown TrenchMaster is must-have equipment for any individual who needs to perform intense landscaping with minimal effort. One of the best features of Brown’s TrenchMaster product is its relatively low, lightweight profile. Many competing products that dig trenches actually come with an elevated profile that is several feet taller than Brown’s product. Although the elevated profile might make trench-digging products look more powerful, the profile is actually a big liability. Taller trench-digging products can cause the equipment to become unstable or unbalanced during particularly challenging work, putting the safety of the operator at an increased risk. The TrenchMaster is also designed to do minimal damage to the area of the lawn that is not being sliced through in order to create a trench. With special guards on either side of the equipment’s blade, the TrenchMaster will be able to dig even the deepest trenches without sacrificing valuable grass on residential properties or in more commercial environments. 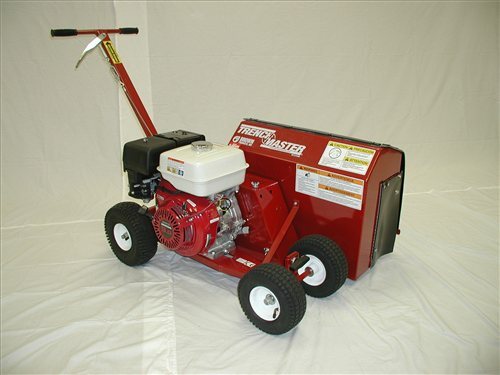 The TrenchMaster comes with a heavy-duty industrial engine that can produce a respectable 5.5 to 6.5 horsepower during regular operation. That might sound small but, when paired with the sharp blade system that comes with every model, it makes for easy trench creation that will require relatively little effort from the operator. The widths of the trenches dug by this equipment are quite large, ranging in size from half an inch to as much as 2 inches. Likewise, the depth of trenches created with the TrenchMaster is quite robust. Generally, trenches vary in depth from a low of 1 inch to a maximum depth of 7 inches. The powerful engine paired with each TrenchMaster allows the equipment to move forward at a relatively fast clip. Operators can expect the equipment to move at about 20 feet per minute, easily outpacing competing options sold by other manufacturers. Perhaps the single biggest benefit of choosing the Brown TrenchMaster system is that it saves homeowners from manually digging fence postholes, cable trenches and other areas of the lawn. The advantages go beyond the mere mechanization of a tough task though. The Brown TrenchMaster allows for very neat and clean trench digging that certainly would not be possible without power equipment. Its adjustable blade and deep-digging capability give it the perfect range for completing virtually any digging task, making it versatile enough to be the only piece of digging equipment needed by most buyers. With fully enclosed rotors and sound construction, the TrenchMaster is also durable. Lesser maintenance requirements and a reduced likelihood of repair means that the equipment will be far more affordable to own in most cases, and that can only be a good thing for buyers who are on a tight budget. Even for power equipment that has been specifically designed for that purpose, digging a trench is no easy task, and the Brown TrenchMaster will require regular maintenance in order to keep its blades and other parts in top shape. When the need for maintenance or repairs does arise, owners of the TrenchMaster would do themselves a disservice by not choosing OEM replacement parts. That’s because the alternative, made by off-brand manufacturers, often does not go through the same quality checks as Brown’s own parts are required to go through. Furthermore, off-brand parts are often made with slightly different materials in order to cut costs. Although the costs are lower, the durability of non-OEM parts can vary. To avoid headaches and more frequent maintenance or repairs, choose OEM parts made by Brown in its factories. Shank’s Lawn Equipment brings a wealth of experience to customers in the form of expert sales professionals, a large number of OEM replacement parts for Brown power equipment, and the broadest selection of products for those who need to dig trenches without risking life and limb in the process. The company’s decades of experience in the industry give it an edge over the competition, and customers can enjoy superior service throughout the lifetime of their Brown TrenchMaster ownership. Since 1984, Shanks Lawn Equipment has been in business, providing parts, service and equipment to the surrounding areas. If you are in the Cumberland Valley or I-81 Corridor, stop by to visit our location and our knowledgeable staff. This entry was posted in Uncategorized and tagged Brown TrenchMaster, OEM, Shanks Lawn Equipment. Bookmark the permalink.